Large Coke $1.50. Side of Fries $2. Denny's new Fried Cheese Melt, $4. Dealing with the poor body image and cardiovascular disease eating this meal will cause you? Priceless. 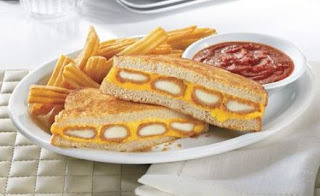 Denny's new arterial clogging creation known as the Fried Cheese Melt does it's best to beat KFC's Double Down for the latest irresponsible meal offered to Americans by large chain restaurants. Order one of these monstrosities when you sit down at Dennys and you will get four fatty mozzarella sticks that have been deep fried in... you guessed it, more fat. Those are sounded by even more copious amounts of heart stopping fatty cheese, layered between two pieces of bleached white flour sourdough, ontop of a platefull of fatty fries, and a bowl of marinara sauce so you can dip this tripple bypass of a disaster in even more calories. To burn that off you would need to do either a hour and a half of high intensity aerobics or rowing machine, or you could run it off in around an hour. Worth it? Maybe not. You're on the west coast, so you probably haven't seen this east-coast restaurant chain creation: the grilled cheese burgermelt from Friendly's. That's a big burger. With two SEPARATE grilled cheese sandwiches as the "buns." 1500 calories. or 1 Carl's Jr Original Six Dollar burger, add Guac and Bacon and you've reached 1000 Calories, add fries and a milkshake and you might not want to eat for 2 days. Nice tips. Those foods can definitely have an effect on our hearts. Instead of eating them, we should take what we think is right for us.